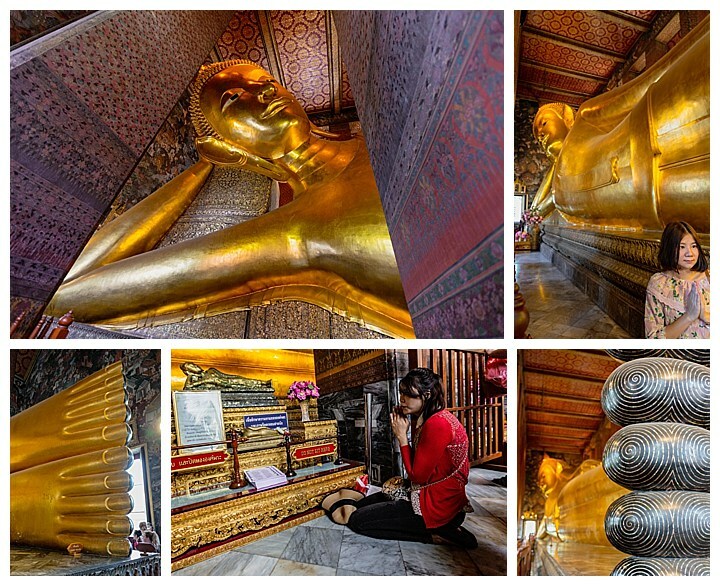 The main attraction here is the Reclining Buddha. This is a huge Buddha made of a gold-copper alloy, laying 46 meters (150 feet) long and 15 meters (50 feet) high. The reclining toes are each as tall as a person walking beside the feet. The building just barely fits the statue, making it feel like it was squeezed inside. 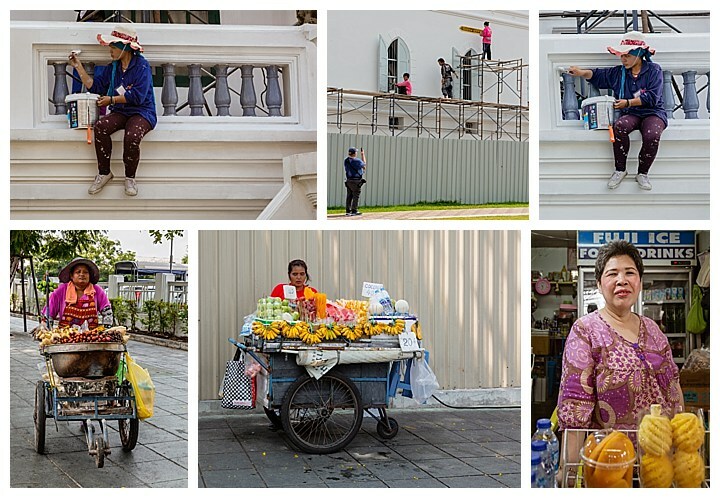 Our second day in Bangkok started with us driving 1-1/2 hours outside the city to visit two of the markets: Damnoen Saduak and The Amphawa Floating Markets(known for its seafood). Unlike the floating markets we saw in Hong Kong and Vietnam, these were located on narrow canals. In some places, the water was no wider than 5 of the boats plying the waters, yet there were dozens of boats all trying to compete for getting through first in whichever direction they were heading. In other words, it was a repeat of the surface road traffic chaos, with the only difference was that everyone was on water. 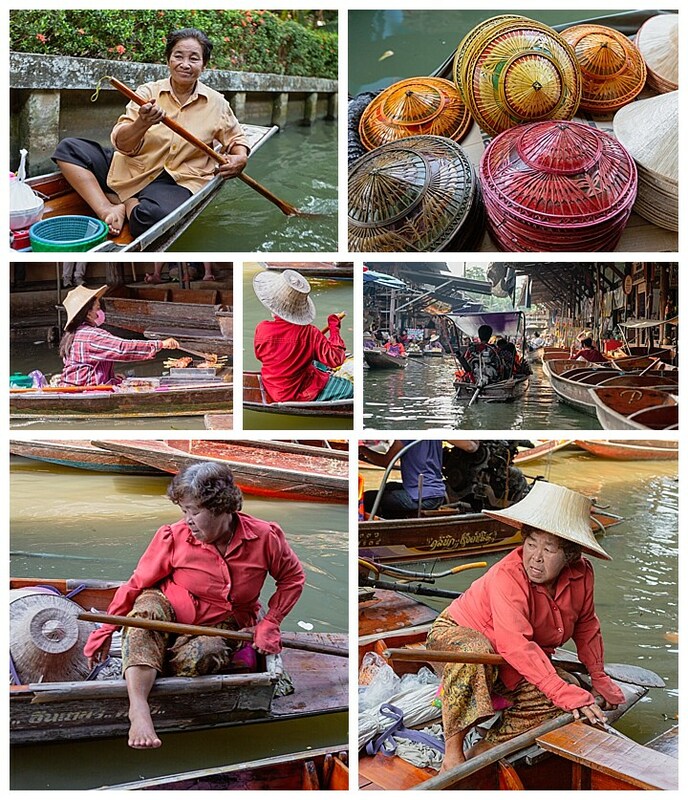 At the Damnoen Saduak Floating Market, there were more tourists than locals. However it still is a scene worth experiencing. 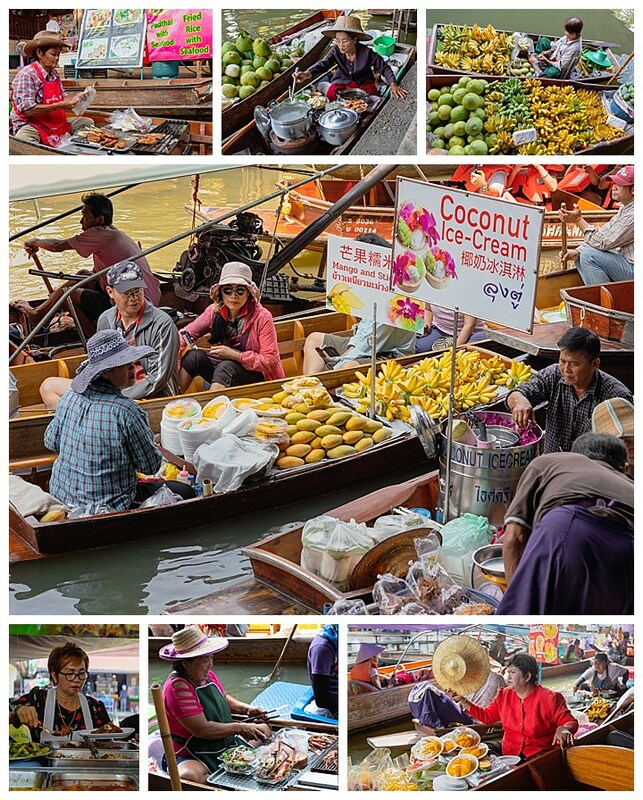 The markets are primarily composed of food vendors, plus people passing to get lunch, either from another boat, or walking along the banks — which were themselves lined with an endless stream of restaurants and food vendors. 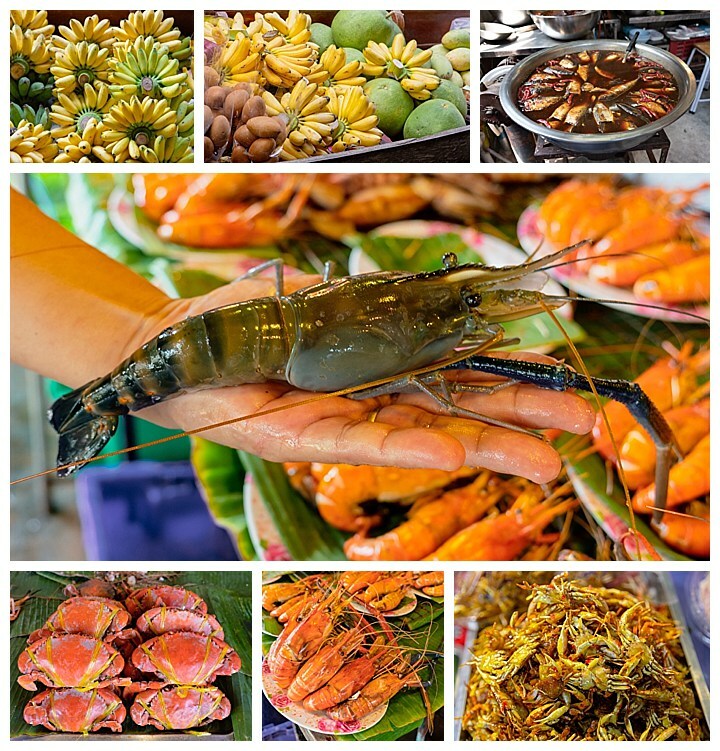 Food was King at the floating markets, and that was dominated by fruits and seafood. Their were a dozen different varieties of crabs, all live and bound by rubber bands to protect the customer, as he chose his meal. Prawns could be purchased already cooked (bottom-center) or still alive and totally fresh (center). 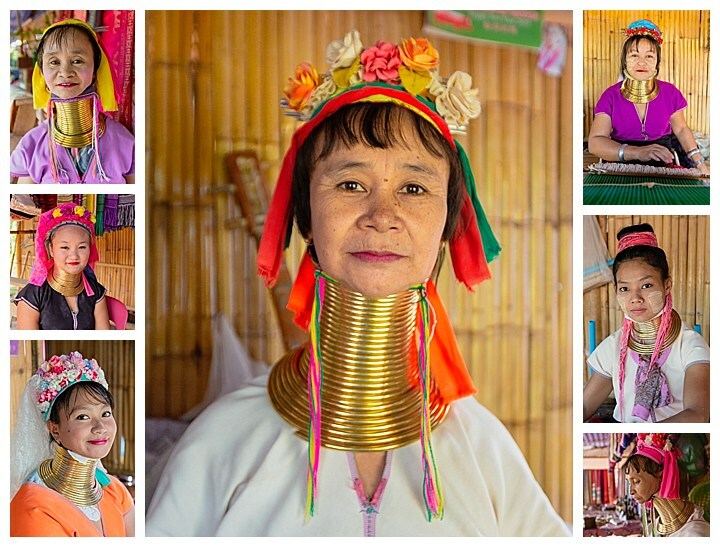 We visited a small Karen village, famous for the long neck women. This is clearly a tourist draw, but it was still interesting to see in person. The origin of the rings is open to debate. One museum we later visited stated that a woman was killed by a tiger in the 17th century, who mauled the woman’s neck. The tribal leader then dictated that all women wear the rings to protect their necks. Others believe it was to reduce the desirability of the women being taken as slaves. In all stories though, it is agreed that they are now worn as a sign of identity and beauty. It is interesting to note that the rings do not really extend the length of the neck. Rather, the weight compresses the clavicle and ribs, causing them to collapse. The rings do result is very weak neck muscles though, and as a result, the women do not take them as long as they live. 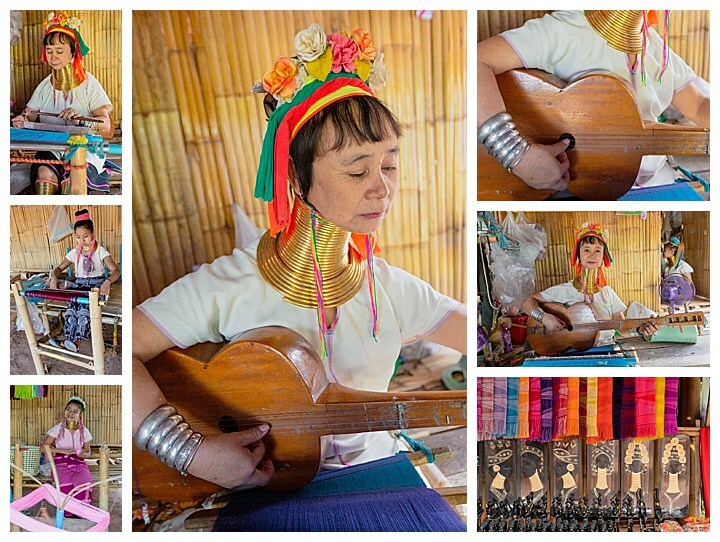 Each woman was making some kind of craft, mostly weaving, which they were selling (we did buy a couple of items). One woman had an old guitar hanging behind her. Evelyn asked her to play, and the result was fascinating. She brought it down, then pulled out some pliers to tune it… then a wooden mallet to bang it to tune some more… then another (bigger) pair of wooden pliers. Finally, she played a tune for us and sang in a very soft voice.